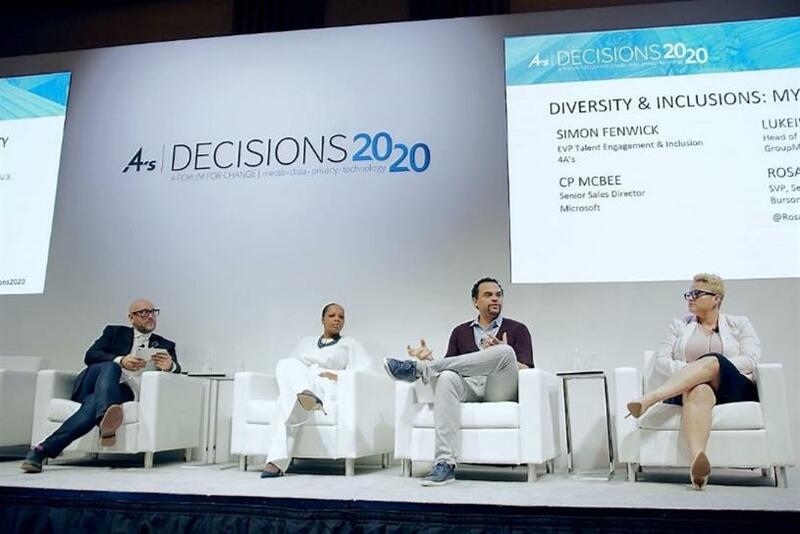 These are the three steps leaders can take today to create immense impact around the diversity and inclusion conversation in a short space of time, said CP McBee, senior sales director at Microsoft, during a panel at the 4A’s Decisions 2020 summit in Washington D.C. on Tuesday. He was joined Lukeisha Paul, head of diversity, equity and inclusion in the U.S. for GroupM and Rosa Nunez, SVP, senior director of diversity and inclusion at Burson Cohn & Wolfe, for a discussion led by Simon Fenwick, EVP talent engagement and inclusion at the 4A’s. "It first starts with you letting your team know that you want to have the conversation -- not that you’re open to it, but you want to hear from people and unpack their journeys," said McBee. "Perhaps one of the most difficult things is sitting and listening without judgement. You need to listen, absorb and really prepare to be challenged." "This is where I was able to turn a corner with the people who I work with -- by sharing how difficult it is to be a leader of color and be the only person in the room, and how I worry about my brown son growing up, and the privilege I feel like I’ve benefited from where as a lot of my friends haven’t. "You don’t need to be a leader of color to share your journey, you just have to demonstrate that vulnerability." He added: "Be consistent with communication. Often times with D&I there’s this real stop-start nature to it and that really resonates as disingenuous with the underrepresented community. It feels like you are bolting something onto the business as opposed to making D&I a part of the business you do every day." GroupM’s Lukeisha Paul argued that diversity isn’t as much of a challenge as the industry is making out and encouraged the crowd to deal with it like it were a client. She explained: "When we look at the challenges that we’ve had as an industry from being all male, and [GroupM] wanted to make it more female, we put a strategy in place. So what did we do? We changed out the policies, we put better maternity leave in place, we offered nursing rooms in our offices and offer situations where women feel better with family matters. "This is a strategy that we put in place to reach a target audience we want to reach. It’s not difficult. We’re built on strategizing: who’s your target audience? If it’s people of color, how do you reach that audience? That’s what we’ve been trained to do in this industry. If we say we cannot accomplish this I would almost ask you to take a step back and look at it as if it’s a client." The 4A's offers a number of tools to help agencies in their efforts to create a more diverse and purposeful workplace.